Dave’s Towing Service has been Simi Valley’s premier provider of vehicle towing and roadside assistance services for over 40 years. Our team is available 24/7 to provide assistance, and we are committed to excellent service in every aspect of our work. When you are on the road and have an emergency involving your vehicle, you need a trusted team you can call on, regardless of the hour and the nature of the problem. 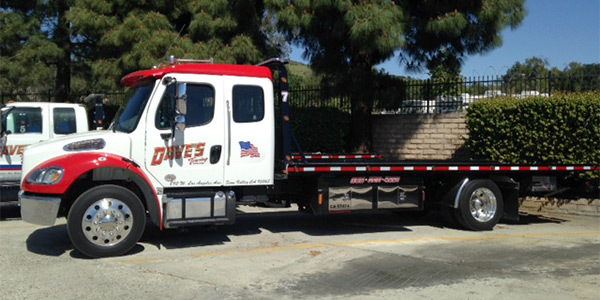 For drivers in the Simi Valley area, Dave’s Towing Service has been that team since we opened for business in 1975. Our company offers roadside assistance and towing in Simi Valley 24 hours a day, seven days a week, and we are committed to excellence in every aspect of our work, from the quality of services we are able to provide to the way in which we treat our valued customers. We provide responsive, high quality towing and roadside assistance services. We are a family owned and operated business serving Simi Valley since 1975. We are certified through the California Tow Truck Association, and are also affiliated with the Simi Valley Chamber of Commerce and the California Trucking Association. We provide outstanding services at competitive rates. We also provide enclosed transport service. Please visit BenchmarkTransport.com for more information. My car was towed by the police, what do I have to do to get it back? To redeem any vehicle that a law enforcement agency had stored or impounded you must have, current registration, a valid drivers license for the class of vehicle that you are trying to pick up and in most cases you must obtain a written release from the agency that had us tow your car away. Do you offer discounts for senior citizens? Do you tow for AAA? We only tow for AAA / RV. We do tow for other motor clubs including National Auto Club and USAC. Do you sell cars if nobody picks them up? Yes. Please click on the VEHICLES FOR SALE tab for a list.